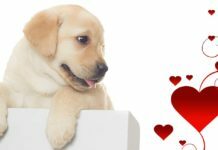 Home Labrador Facts & Fun My Labrador won’t swim! 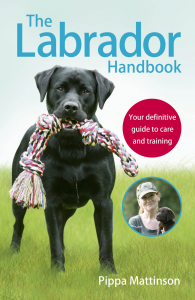 Are you frustrated by the fact that your Labrador won’t swim? [wp_ad_camp_5]Many people assume that Labradors like water. After all, this is a breed that is historically linked with working alongside hardy fishermen in the icy waters of 19th century Newfoundland. So it’s only natural that we assume that Labrador puppies are born wanting to take to the water. 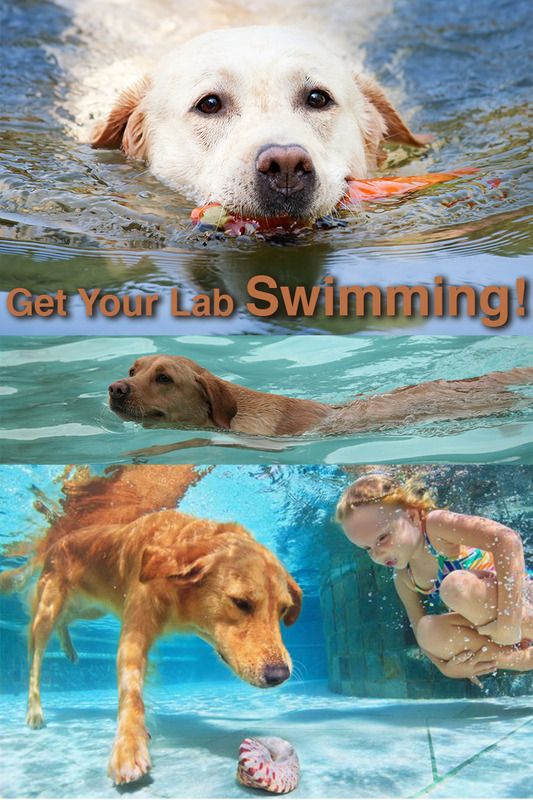 But not all Labs like to swim! And those whose Labradors won’t swim often feel disappointed or even a bit embarrassed by their furry friend’s lack of proficiency in the swimming department. Why doesn’t MY Lab like water? 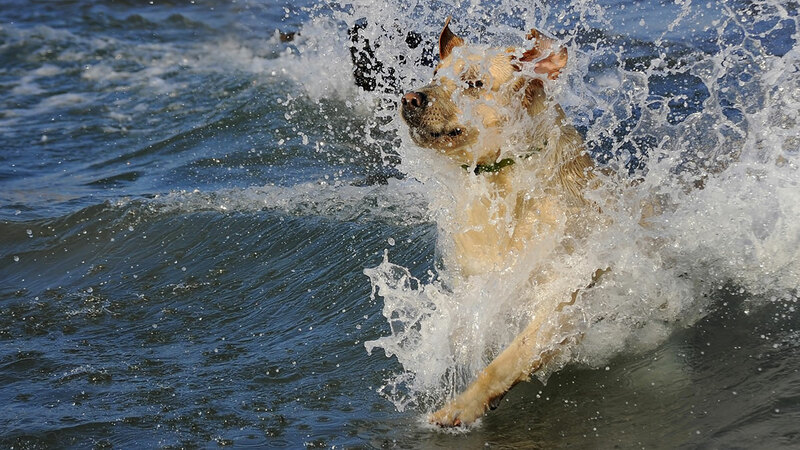 If your Labrador is afraid of the water or reluctant to swim, there are good reasons for this. And there are lots of ways that you can help him. We are going to look at some of the most effective ones in this article. 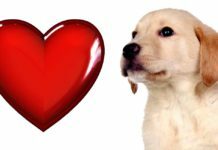 The main reason that a Labrador doesn’t like water is usually because he wasn’t introduced to it in the best and most appropriate way. Labrador puppies that belong to professional gundog trainers all enjoy swimming and retrieving from water. And that is simply because they are usually introduced to swimming, often at an early age and always in the right way. With very young puppies this usually means making swimming fun alongside an older, familiar dog, or friendly human, who inspires confidence in the puppy. With older puppies we can focus on the dog’s love of retrieving and on getting him to retrieve across shallow, ankle deep, water to begin with. If your lab missed out on this careful introduction, he may well refuse to even get his toes wet, never mind fetch a ball from the sea. But don’t panic. It is never too late to start. My Labrador Doesn’t Like Water! 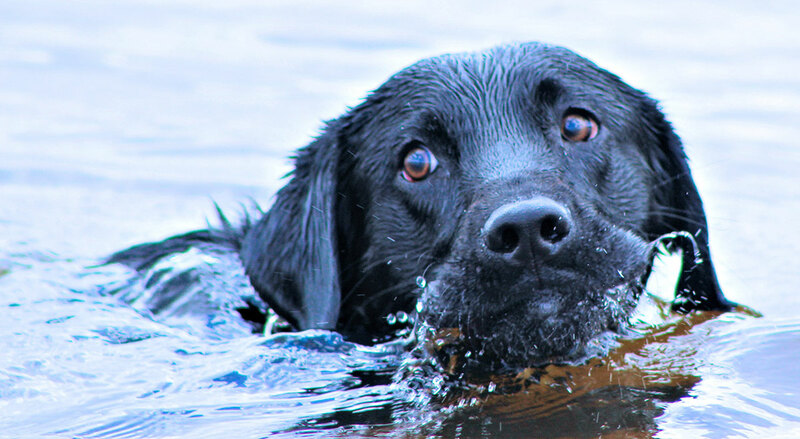 Even if your dog doesn’t like water at the moment, all Labradors enjoy swimming if helped to overcome their initial fear or reluctance to enter the water. If you have an older labrador that has never swum, getting him swimming might take quite a while. You might feel that it is not worth the time and effort. However, don’t be downhearted, it is never too late to start, and it’s worth considering that once a Lab loses his fear of water, swimming usually becomes one of his greatest pleasures. 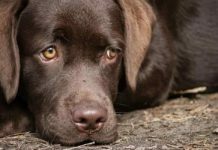 If you want to have a go, and your dog is quite nervous around water, you will need to desensitise your dog gently over the course of a few months. 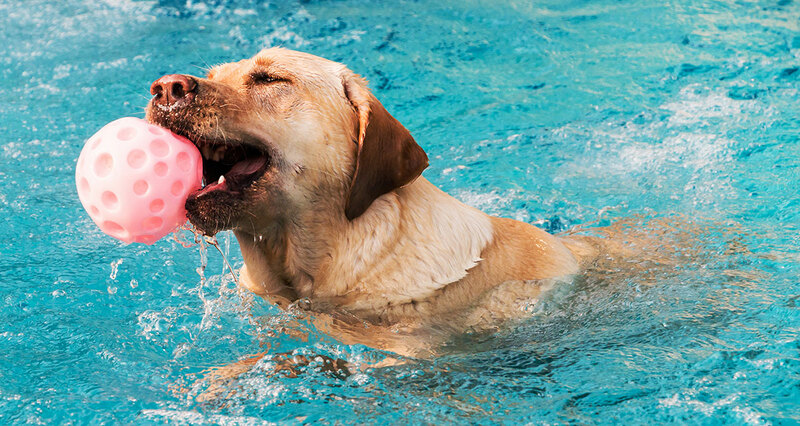 Some labradors, especially younger ones, will be encouraged to swim by repeatedly being taken out with other dogs that enjoy the water. 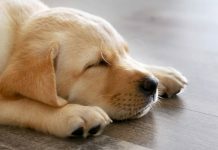 [wp_ad_camp_2]However, be aware that a dog which is really scared of water may become even more scared if another more boisterous dog showers and soaks him the first time he puts his paws in. I have done this with a few dogs, and I should point out that you need to be aware of the stages involved. Just because a dog will swim along next to you whilst you wade up to your waist, does not mean that the same dog will go into the water of its own free will when you are standing on the bank. Sometimes a dog will swim alongside a person because he is afraid to leave them. Rather than because he is enjoying the swim. However, if you can get the dog swimming alongside you happily, then he will quickly lose his fear. The clue is in the word happily. If he is just bravely swimming alongside you rather than lose sight of you, he may still be afraid of the water. Just not as much as he is afraid of losing you. This dog will still need his confidence building up before he is willing to go it alone. Retrieving is my absolute favourite method of starting a dog swimming. But it has to be done gradually. Don’t be tempted to throw a ball or retrieving dummy into the water for your reluctant Labrador or young puppy to fetch. Even if he is a keen retriever, his fear of water may outweigh his interest in the ball, and you will also have created another problem, refusal to retrieve! Instead, teach your Labrador to cross a tiny and insignificant puddle to get at the retrieve on dry land on the far side. You can put obstacles either side of the puddle or even create an artificial one, so that he has no option but to go through it. Once he will splash happily through a puddle and back with a ball or dummy it is time to find a tiny shallow stream. And I am talking seriously shallow here. It should go more than about a third of the way up his legs at the deepest part. Again, throw the ball across to land on dry ground on the far side of the stream. If he hesitates, go with him the first time or two, race him across. Be silly about it. Have fun. He will soon forget about getting his legs wet. You can see where we are going with this now. Over time you can move on to deeper streams. If the dog has a history of being wary of water, it is important that you do not ask the dog to pick up from the water yet. 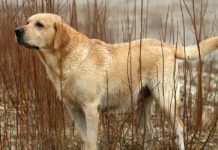 Always throw the retrieve to the far side of a stretch of water that he cannot run around. This is also a good principle for gundog training as it lays the foundations for crossing obstacles. Is it worth teaching your dog to swim? If you do not intend to work your labrador, you may feel it isn’t worth the bother of getting him into the water. And you may be right. It all depends on your lifestyle. Rest assured your lab can swim, and if he fell into a river, lake or canal he would not sink. But, just like people, dogs get better at swimming with practice. A competent swimmer will be calmer and more likely to survive if he falls in to deep water. He won’t panic, and will be able to paddle around preserving his energy until he finds a way out, or someone comes to his rescue. So if you spend a lot of time around water, it is a good idea to get your dog some swimming practice. 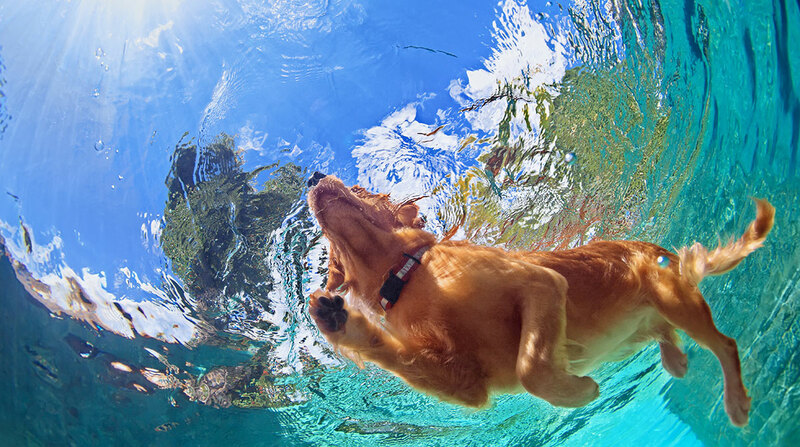 Swimming is also great exercise for dogs with joint problems because it is not weight bearing. However, despite the fact that dogs can swim instinctively, you should never throw a reluctant dog into the water. If you do, he is unlikely to ever be willing to swim again. Whilst an adult labrador is perfectly happy to swim in cold water, a pup or youngster may be put off if his first experience is a freezing one. [wp_ad_camp_1]Start getting puppies comfortable around water when they are small provided that the weather is warm. Let them splash around with an older dog if they enjoy it. 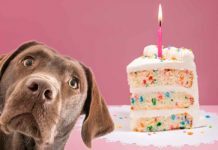 It is a great idea to get your dog retrieving from an early age so that you can use the retrieving method to get him swimming properly later on. Whichever method you use, you will need to put a little time and effort in. One or two visits to the local pond or pool is not going to cut it with a dog that has disliked water for months or years. You will need to be persistent and take him regularly in order to desensitise him and relax him around water. Some pups are complete water babies from day one. You can’t keep them out. That’s ok too. Make sure little ones can’t get into trouble in deep water, and enjoy the view! How did you get him swimming, or was he a water baby from the start? Share your experience in the comments box below! 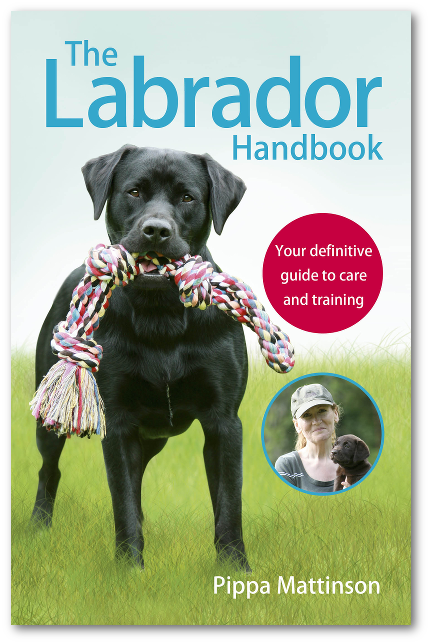 You can find out more about how to keep your Labrador as fit and healthy as possible in the Health section of our website. hi, we have two labs yellow 7 year old ‘Chip’ black 3 year old ‘Diesel’ – the yellow lab loves water and would swim all day if he could – not so keen on bathing though! he will walk happily past the sea, river, pool but if you tell him its ok to go in, he will run straight in and swim about, play come out roll around the sand, stones grass people, then run back in, our younger black lab, follows his older bro everywhere, jumps in after the yellow lab, but as soon as he cant touch the ground he stops, he will jump up and down (excited) but wont or cant swim, he never minds being wet. the last time we took them swimming the yellow lab swam to his hearts content, but the black one barked, bounced and seemed to attack the yellow one, for leaving him? or not being able to swim? I filmed the behaviour to see if we could figure out what was going on.. if they go to the river they have a bath when they get home, we took them swimming yesterday and after the bath at home the back one has dropped tail.. at no point was the black lab made to go in the water, its his choice. both labs are strong fit males, now we are concerned that the black lab is feeling upset at maybe not being able to swim? he is a lovely dog, very well behaved and wanting to please. I got a black lab when he was 6 months old. We lost him last year at 12. For 12 years that baby walked around a puddle on the sidewalk if he could. Would go all day with out going out to pee if it was raining. He didnt want to be wet. We tried a kiddle pool in the back yard, a calm clear river, the ocean….nope. No treats, balls ,other animals or his hu ans could coax him into even a kiddie pool.. He seemed to get anxious when we got in the water, pacing, panting, whining and barking for us to get out of the water. When he was 3 or 4 we got a 2nd lab and she went right in the kiddie pool and later in the ocean….he stood out of the water barking at her too. He was a happy dog his whole life, but his happiness just didnt include swimming or going in for a dip on a hot day. Now he loved a car ride….my female doesnt like to ride in the car. Getting my lab comfortable in and around the water is a must for me as I want him to join me on canoeing trips in the future. We are fortunate that we live a couple of miles from the coast and he’s been going to the beach at least 2 or 3 times every week since he was 8 weeks old. At first he was cautious of the water but we worked through that by getting him to run through shallow puddles and slowly building up the depth as his confidence grew. We found having mum on one side of the water and dad on the other was a good incentive for him and also walking through it with him. We got him used to being out of his depth by finding water that went up to about thigh/hip depth on me and I would walk through beside him, supporting his collar a little until he got used to the idea that he wasn’t going to sink. We then progressed onto encouraging him to swim solo by throwing his ball for him to retrieve. He’s now six months old and swimming for his ball is probably his favourite activity (though excavating the garden is a close contender!). We’re slowly introducing him to waves and moving water as well as working on his swimming stamina by gradually increasing the amount of swimming he does each trip. On my to-do list is to dig out my wetsuit and go in with him for a proper swim. I’m really happy with his progress and think the key is just to keep it fun and progress at a speed that never puts him outside his comfort zone. Love, love, love that our Labs will swim all day at the lake. Our yellow boy can be lazy about retrieving whereas our black girl will retrieve all day. They love their kiddie pool, the shower and if there is nothing else available, dipping their whole heads in their water bowl and blowing bubbles. Best dogs ever! Are you going to do an article entitled ‘my Labrador won’t stop swimming’. We’ve got three labs who can smell water (be it clean rivers and lakes or stagnant ditches) from a mile off and always make a beeline. We have to keep them on leads if we don’t want them to swim! This may not work for every dog but it’s worth a try. My lab was born in Latvia and started swimming when she was around 3 months old. She loved lakes but hated baths (No idea if that’s relevant). When her vaccinations were complete we brought her home to UK where she hasn’t ever went swimming. She turned 2 in Spring and we went to Latvia the following Summer for a holiday taking her with us. Once arrived I took her to the Lake to see how she is with swimming. I threw the ball quite closely to the coast which was fine by her. She ran back and forth and quite enjoyed water however never actually went further than where she could stand, so I had to go get the ball myself a few times. I have then took her to the other end of the lake where it was deep straight away and put her into the water. She swam well to the other end but still wasn’t confident going deep herself. So I basically done it a dozen of times until she became confident. It took a few days and some amount of patience but she got there. 1. Throw a ball in the water gradually increasing the distance. 4. Avoid big crowds of people. 5. If your dog is tired, don’t force him/her to swim. Take 5-10 minute rests and bring clean water with you. My best advice would be is to teach your dog to swim from a young age to avoid complications when they’re older and go swimming at least once a month to keep up their confidence. My Labrador used to be very shy of water. He was born in the NZ drought of 2014/2015; he didn’t experience rain and puddles until he was a few months old. Within days of his vaccinations being complete, he required emergency surgery for an intestinal obstruction and we had to keep him dry for another 3 weeks. I placed a lot of emphasis on socialisation and habituation – but he missed out on water experiences. When we did get the odd shower of rain in the autumn, he would not even walk through the shallowest of puddles. I kept taking him along to a popular water area in a dog park, where he would play with other dogs on land, and watch them with fascination as they were having fun in the water. Afterwards, we would go to a quiet water area – a very shallow stream with very little current. I would hold a treat out over the water, and he slowly began to get his feet wet in order to reach the treat. I would throw a tennis ball into the water very close to the bank for him. One day, when he was about 6 months old, he was so engaged in playing chasing games with other dogs around the water that he forgot to “put the brakes on”and ended up fully emerged in water. He surprised himself and looked absolutely stunned. From then on, his love of water evolved as he grew in confidence retrieving his beloved tennis ball from deeper water and stronger currents. And he got a great deal of enjoyment out of beating other dogs to their balls in the water! Yet, until he was about 15 months old, if there was no ball involved he would generally prefer to stick close to the water’s edge where he could still stand. Now he loves swimming – it seems to have been a natural progression. Hi Pippa, my lab is 11 months old and never quite liked the water. Just recently he surprised us by wetting his legs in upto the belly but no more than that. I’m happy to give him his time but when he is ready is it fool proof or is there a chance of sinking? I don’t swim hence the fear. And this would be the sea hence even bigger the fear. My 10 month old lab loves the water but was a really timid when it came to getting deep enough to swim. I had been trying to gently coax him into the water for about 3 months without much luck. Basically he did not know he could swim. Finally I decided to be a little more persuasive about the water. He loves to retrieve so I used that to my advantage. I threw his dummy about 10 ft out in the water so he would have to swim for about the last 5-7 ft of it. Like usual he ran right up to the point where he would have to swim and stopped, except this time there was no stopping. I put my hand right on his hind quarters and gave him that last nudge, he started to swim. I followed him in swimming right along side of him. At first he was a little uncoordinated, but he followed me out into the water after the dummy. After about 15 seconds he realized he was a pretty good swimmer. I continued to use a combination of the dummy and me jumping in to get him over his fear of jumping headlong in. It took about 3 sessions of this before he would go all on his own. Now the Trick is to keep him in the boat when we see waterfowl (he is my duck hunting partner). I never suggest pushing your dog into the water solo, this will likely make them even more fearful of water should they have a bad experience. What I did was get him swimming then jumped right in behind him to show him that everything was just fine. In doing so he learned to swim and it reaffirmed his trust in me that I have his back. My lab lucky has learned to swim in one of way: I jumped off the boat with him in my arms. Some people don’t like this, but he was wearing a doggy life jacket (Me, a human one) and pretty soon he figured out how move around since he could already float. Once he was chasing me around and playing fetch, I moved him to shallow water (maybe 4 feet, just deep enough so I could touch and step in but he couldn’t) and I took his life jacket off. Instantly his back end went down but just as quickly it came back up. He swam over to be and began licking my face and rubbing against me etc. so o think he had a good time. Now, he is absolutely addicted to water and even jumps in the bath on his own, without me saying “time for a bath” or anything. I have a 13-week-old labrador, Monty, who doesn’t like water at all – except to drink. He can just about cope with light rain, but when we had heavy rain at the weekend he refused to go outside and his toilet training regressed. And he dislikes walking through puddles. This morning he had no choice. We were walking on a concrete path along the coast and he tried to go through the railings (there was a long drop to the beach) rather than walk through a deep puddle of seawater across the path. Our almost 7 month old chocolate lab, Zoef, is obsessed with all water, from the beach to the pool. If he is retrieving a dummy in the pool, he jumps in, swims over and grabs it, swims straight to the stairs and out of the pool. He will jump into the pool even when there isn’t anything to retrieve but then he swims around in circles, flails around, yelps, and seemingly panics. His eyes get very wide and wild looking and his back end sinks. We have had to get in and save him a couple of times. But even after these episodes he wants to get back in the water again. He seems okay when we are in the pool with him. Once he panics, though, it is like his brain gets overloaded and he no longer listens to us even if we pull out his favorite toy or an irresistible treat. We had an incident this past weekend where he ran and jumped into a very mucky stock pond. He would not come to us or even make eye contact. He swam in circles, yelping, and taking on water. Our daughter jumped in and pulled him out. He is young and impulsive, so while we work on his recall and swimming skills, he will wear a life jacket when around deep water. We think Zoef is young and doesn’t really have confidence in deep water. It’s like he doesn’t know he can swim. My rescue cocker spaniel was afraid of water when I got him at 3 yrs. He would forcefully back off. I did the getting in and being fun, shallow then gradually deeper. He now is happy to go in and splash about up to his depth of his own free will. He will swim to me but it’s a case of braving it out rather than enjoying it – so I no longer do that. He’ll never be an enthusiastic swimmer but if he over reaches during a sniff and falls in water or if he doesn’t spot a sudden deep bit, he no longer panics and simply swims back. He’s very happy in shallow water up to his depth so I’m happy with that! Our older lab (now 7) was always reluctant to get her tummy wet no matter how we coaxed her (food or us swimming), she was brought up alongside a rescued Kelpie who simply hated water. Our labs daughter was showing similar water shyness until at 12 months she started jumping ditches on the retrieve and occasionally ‘getting it wrong’. We then Started her retrieving in deeper and deeper water and finally took her to S France where she happily came into the sea and swam out to be with us. She now loves swimming and will retrieve in mid winter. Her mum too has now started to swim – either to be with us or to retrieve floating treats – the square white ones float best and are most easily seen. Gloriously I took one of the pups siblings out into a calm sea (very gently) with me for a swim. Our pup swam shoulder to shoulder with her sibling to see it safely ashore. The memory will last me forever and the other pup (now full grown) is now much less afraid of the water although still not a keen swimmer. Any tips on cold water? My 8 month old black lab love to retrieve and love water and loves retrieving in WARM water but does not want anything to do with the cold. I had to help him in the water at first in the summer but i dont want to force him in to the cold because Im afraid he may be too young and i dont want to ruin him. I plan on using him for waterfowl so cold water is a must. Any thoughts? Hi, my Labrador is 4 years old now and hates water. Every time I try and take him in the little baby pool, he is hesitant to even put his claw in even when I am offering beef jerky… I need help please. My 6 month old chocolate lab swam for the first time today. He has been reluctant on previous visits to the pool. We used the retrieval method and today he just went for it! He seems to really enjoy it too! I am so happy to read this – we adopted our lab at 1.5 yrs of age last fall from a shelter and he was terrified of the water! 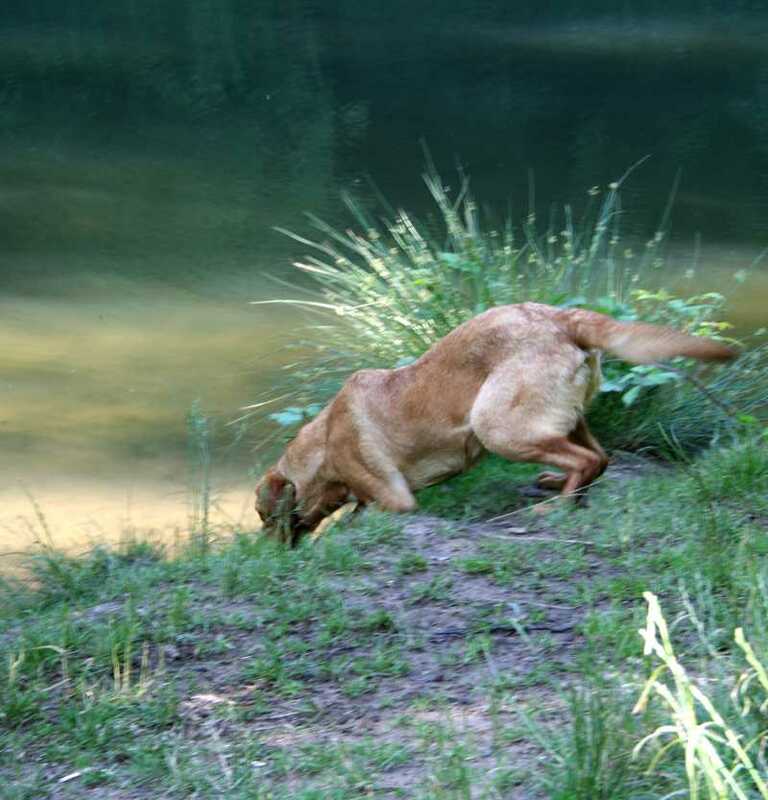 I’ve been working with him slowly and taking him to ponds and lakes and doing all the things you recommend and he keeps edging in a bit more and more, but still not retrieving from deeper water… only the water he can touch. I have faith to keep it up and eventually, he’ll be a swimming boy! Thank you for the information. My 2 year old yellow lab will go into the water, but only on the first step of our pool, she will never step off it and swim. Why won’t she swim? My 10 moth old chocolate lab loves the water, i take her to the canal as much as possible and she goes in i can tell she is dying to swim but wont go in any deeper if she cannot touch the bottom its like she panics. Ive tried fetching and let her play with other dogs that go in but it just doesnt seem to be getting her confidence up to take the plunge. I’ve taught lots of reluctant dogs to swim. If the dog is large you may need another adult to help. (you can practice lifting it at home) gradually lower the dog into the water, the legs will be in swimming mode well before they reach the water, hold the dog in a floating position while it “swims”, but DON’T release it, hold it in the water for several minutes or until it is relaxed, only then slowly release it, aiming it toward the shore. You may need to do this a few times over several days till the dog gets its confidence and learns that it won’t drown. Needs to be in summer, wear your swimmers, you will be as wet as the dog. Take a towel and make drying the dog fun, so it is not left cold and miserable. My only failure was a Bassett hound, they sink! I have a 3yr choc lab and a 18 month yellow lab. Both labs will swim if I throw a ball/stick into the water but neither go in voluntary. I prefer it this way because I can control when they go in the river and when it’s safe to swim. Our river is flowing very fast and dangerous at the moment and I would panic if either of them went in. Although I do realise that my 18 month yellow may become more interested as he gets older. Hello, i have just got a chocolate labrador, she is 18 months old, i have just bought a pool, its 1.5 metres deep, with a shallow end at just .5 metres deep. she is a rescue dog, and i think that she has had a bad past where she has been forced into water, because when i take her down to it, she runs away, i havent forced her in, i took her so she could see it. any ideas of how i can help her overcome her fears of water? No about of gentle coaxing will tempt my lab into the pool. What do you suggest? I’m worried about his safety if he doesn’t learn to swim and exit the pool safely. He is a 6 year old rescue. Should I try a kiddie pool first? Hi. My 18 month old lab still isn’t keen on swimming. My dads German shepherd has always been a wimp when it comes to swimming and I think she has picked it up from her. We live on a farm and have a pond out the back of the yard. With it being so hot recently I decided it was time she got over her fear and started swimming regardless of the German shepherd. She has always happily gone around the edge where she can feel her feet on the bottom but hates it when she can’t feel the bottom of the pond. So I decided to go in so she wouldn’t be as nervous and to support her so she could realise that she doesn’t need to be afraid when she can’t feel the bottom. At its deepest its just below my shoulders (I’m 5″4) so ideal for the dogs. It’s quite oval. I’ve had her in everyday for 10mins max as I didn’t want to turn her sour against it and she can swim fine when I’m next to her and is happy to swim back to the bank on her own but she is still so unsure about taking that step away from where she can feel her feet. I’m going to get our friends 2 labs over tomorrow who love swimming just to keep installing it that its fun but I don’t know what else’s can do. Am I doing right by doing it every day for 10mins or is that too much? Sorry to ramble on I just want her to swim! Thank you! My chocolate Bessie is almost 13 months and has just decided that swimming is fun, she was always happy paddling with her collie “sister”, so this week with hot weather I took both dogs to the loch and gradually increased the depth of the toy for them and praised Bessie enthusiastically when she brought it back, she now thinks swimming is great fun, Meg the collie has no intention of swimming – ever! hi i have only just got a black lab and he is only about 4 more days untill he is 8 weeks we were alowed to take him home earlier so we did beacause then my dad would be home to make sure he dose not get out of the house. so i was playing with him and i ran around the pool then i looked bake and sour him in the pool head first under neath and could not swim yet so it looked like he was drowning so i ran over to him and grabed him and put him on the paving he sprinted off and i got a towl and dryed him then he went to sleep for a long time and now i dont know what to do because befor he was looking down in too the pool and looked like he wonted to swim and jump in and now he is terified. so please help me what should i do because i do not wont him to be scared of the water. please help me. Hi Phoebe, what an unfortunate accident. You must have been very worried. Labrador puppies can swim though of course falling into a pool is not the best introduction to water. It is quite possible that you were more frightened than him and that part of his fear is from your reaction. You can’t undo what happened, so, try not to worry that he is going to be scared of water. But make sure that you figure out a way to ensure he cannot fall into the pool again, and introduce him to water carefully as described in this article. Splashing about in puddles when he is old enough to go out and about is a good way to begin. Our black lab male was afraid of the water when we first tried swimming. This last winter we took him to a indoor doggy pool where a woman trainer would swim him once a week. He went from being afraid to go down the steps into the pool, to going down the steps on his own, to cautiously jumping in from the side of the pool, and to jumping in without hesitation. Over this time he really started enjoying the water. We have a boat and take him out with us all the time and he would still be afraid to go swimming outside of the pool. He would whimper as the kids would swim near the boat but was still afraid to jump in. Well this summer we finally got him swimming in the lake on his own and he will now jump off the boat into the lake on his own. Our lab Tina would swim and retrieve from fresh water but with no great enthusiasm. Take her to the beach and she would crash head-long through the breakers without a blink and with obvious pleasure. My youngest Lab kaga loves swimming, but always jumps on my oldest Lab’s back. Now that poor Steena is getting older, she hasn’t got the strenght to shrug the wee one off, so several times, l’ve had to wade into the water myself to save the older dog. My year old labrador Maia has only just found the joy of water. Until she was 9 months old she wouldn’t even put her paws into it. We went to the beach with friends and ther dogs and she stood on the sandbank and watched as they had fun, swimming, splashing about and retrieving toys. We also had a local walk by a river and she only just got her paws wet.Then she began to follow a friend’s dog as he waded into ditches, and because she wanted to join him, she actually slid in. At first she wasn’t all that happy but she persevered. Then about 4 weeks ago my friends and I took the dogs up to a glen where there was a river and a good pool for the confident ones to swim. That was it, a turning point. The other dogs went away in and Maia just went for it. She now loves the water. She just needed to build up her confidence and have the reassurance of the other dogs. Lovely story Valerie, it just takes some dogs a little longer to get that confidence. Thanks for sharing. Hello, my six month old Labrador doesn’t like swimming! We live close to the sea so we have many opportunies of going to the beach. I’ve tried with retrieving (sausages) but it doesn’t work! I’ve tried pretending I was drowning but he wasn’t very worried about loosing me…! I WOULD PREFER NOT TO!!! He is an incredible quiet and wise puppy! Hi Moira, as you live so close to the sea, you can desensitise your puppy to the water in a nice gradual way. Have him on the lead and just walk him up and down on the edge of the water as often as you can. Have the water just lapping over his feet and don’t make a big deal over it. Just walk up and down as if it were perfectly normal to walk in the water rather than on the sand. When he is completely comfortable with this all you need do is take it a little deeper each time you go. Avoid taking him when the sea is rough, and gradually work up to a point where you are waist deep and he is swimming along beside you.